As I’ve previously mentioned, I live in townhouse/condo here in Duxbury, MA. This is a town with precious few condos and I was lucky to get into one. My building was built in the 1980’s and I had to do a lot of work when I moved in bringing the place out of the 80’s (ripping up carpet, installing hardwood floor, new lighting, etc). The one room I’ve not really touched so far is the kitchen. The only thing I’ve done is put is install the black and white checkerboard tile. I’ve been wanting to paint my nasty knotty pine cabinets for a long time and I’ve been girding my loins for the challenge. My kitchen is tiny, but it will still be a lot of work. And as this will be a total DIY on a budget project, I’ve been dragging my feet about the whole thing. Of course, the decision about what color to paint the cabinets is the biggest one. I’ve been wavering back and forth between dramatic black or soothing grayish/green. The inspiration for the black came from my own powder room that is on the same floor as the kitchen. It too has the b&w checkerboard floor and had the same nasty knotty cabinets. I painted an undercoat of a soft unripe tomato red, and then covered with a high gloss black and rubbed off some edges for an antiqued look. I did this several years ago and still love it and it still looks great. No chips, etc. So, this was very easy to do – especially where I didn’t bother to prime or had a need to treat the knot holes since they’re not going to show through black. So, black it is, right? Well, as a few friends have pointed out – my kitchen hasn’t got a lot of lighting. One window and only two overhead lights. I don’t have the budget to add recessed lighting at the moment. I may try to add some under cabinet lighting, but the lip is very small, so that may not be an option. So, black is problematic on that level. Oh, and by the way, the walls will be painted in an off white. So, like any good blogger, I took to google and some of my favorite blogs and magazine websites to see if I could get some inspiration. So, here are some fantastic black kitchens. Which reminded me that I am also drawn to softer, more soothing colors. Which also reminded me that I’ve loved soft green since I was little and when given the choice, I am always drawn to it. My antique desk that my father refinished for me many years ago. Okay, so, hmm… now I’m veering towards green. Which is problematic because it will be harder to do and require more prep work so that the nasty knottys don’t show through. I also have a lot of green in my house, and does this tip me into overload? And finally, how do either of these colors effect resale? Not that I’m planning on selling soon, but you never know what life will bring. I really like the black cabinet option but worry that without a second window or a wall you can paint a light color, it could be very dark for you. I vote for black. Why not add a fab black chandelier for extra ooph and lighting? Maybe some uplights in the corners of the room for unexpected drama! Though your space is tiny, I'm liking the black option also. You'll have other opportunities to brighten up the space with accessories (mirrored backsplash?) and lighting will be key. Bright reflective surfaces will glam it up a bit and avoid making it look like a goomy hole. I also have a tiny condo kitchen with (currently) white cabinets that are a PITA to keep clean… I may take a cue from you and go black! I like the black in theory, but would be a little worried about the lighting situation. Good luck! I just wrote about painting my kitchen cabinets white. It was a bear of a job, but probably because of the paint I used. My first reaction was black! But then I saw the pale green and realized it might brighten the room. Plus, it's a very classic look. See, it's funny, black seems to be a real attractive option, until we start thinking about the lighting issue. I don't have granite countertops, just off white formica. And that's not about to change too soon. The rest of the room will be off white walls and ceiling- regardless of the cab color. I was thinking mirrored backsplash for a moment, but only if I could find really weathered, antique mirrors. I wouldn't like it too shiny like Miles Redd's kitchen. A little too dramatic for the rest of my decor! I usually don't really like black, but in this case I think it's the winner! A black kitchen can look so glamorous if done right! And I really think it suits your cabinets. Would you go for all black (counter top tiles aso), or just the cabinets? I am worried about the black making your kitchen feel dark and tiny. I love black cabinets but in this space I am leaning towards something lighter. What about a White Shade with black hardware, black countertops etc.? * Call me the "odd-woman-out", Linda, but I suspect some form of GREEN might make you happiest in the long run… Lots of well-taken points above~~~ b-u-t IMHO, since you have cold, snowy winters there, after about a month of it you might opt for something a little, for lack of a better word, "happier". Chad's design/colors were fab… I love black cabinets… I also like green… and whites… and tawny taupes… and even a certain shade of "nasty old yellow"… And as YOU know, ANYTHING looks good when done well, and since YOU have the skills to PRODUCE a well-done space, IMHO you ought to go with YOUR GUT FEELING and not think what OTHERS will think/say/react… Get their opinions, yes, BUT, in the end GO WITH YOUR GUT INSTINCT!!! I can't WAAAAIT to see what you do!!! Goooood luck, kiddo! 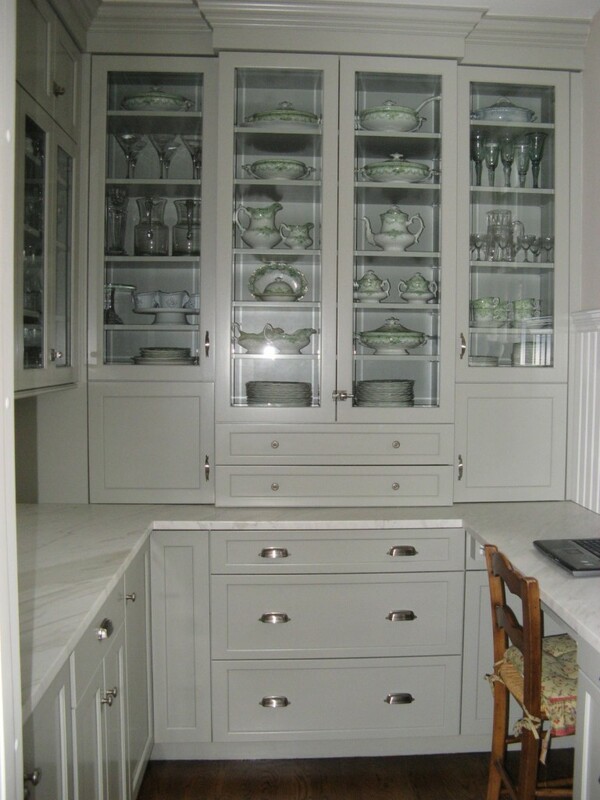 I'd go with a gray-green – closer to Willow Decor's butler pantry color. Very elegant and it could play of the classic style of the checkerboard very well. I too have a 80's kitchen and did my cabinets in a graylish/green. I love them. I vote for the green. Plus, everyone is doing the black thing and soon it will be overdone. I look forward to seeing what you do. so the gray is now out? haah!! hard to say hard to chose. I really don't know what to choose but I think I like the black bettern than the green, but I also like the gray better than the green. hmmm. I love Gina's kitchen but I call that grey not green though it's a green gray. I'm stalling i know!! I love your powder room btw. You will not get a vote out of me today!!! I can't decide between gray and black even though gray isn't an option. I like the idea of a pale green the best too! I love those black kitchens, but as someone else who also has a tiny kitchen, I think all black cabinets would be too much. Maybe if you broke it up? Would it be a possibility to maybe do the bottom cabinets in black and the uppers in a very very pale green? Or a white over a green and antiqued (like your bathroom)? If you want to see my kitchen, it is in my "It's good to be Home", post that I posted on may 28. What I immediately noticed was that in all the photos with black kitchens, they all had tons of light. With one window, I would worry that you'd feel claustrophobic in the end. I vote for the grey green. I am a bit biased, as I painted my kitchen walls BM Grey Owl and love them! And then hardware in chrome/polished nickel would look fab! Or, after looking at your kitchen again- since you say you have a lot of green throughout the house what about a light pure grey? That would be beautiful with your floors. How about painting the cabinets green and then accenting the angled portion of the recessed cabinet doors with black. You'll lighten up the cabinets and tie it in with the black tiles. I vote for the soft green gray option. I too, love black kitchens but think they work best in large, light filled rooms. I can't wait to see what you decide on! Since you mentioned your kitchen is tiny, I think the black will make your kitchen even smaller.The green cabinets will give you the classic and timeless look. Adding any color to a black and white combination always work. Green. Absolutely. It would be a nice contrast to your checkerboard floor and sometimes black cabinets on the top can be oppressive. What about black on the lower and cream on the upper? Be sure to top coat any black since it shows scuffs, etc., very quickly. BTW – Ben Moore low lustre oil is excellent for cabinets. If you don't have access to a sprayer, use a small mohair roller, lay the doors flat to dry and they'll have a nice smooth finish. Thanks everyone for your comments and input. I'm loving all the great ideas. In answer to some questions, the counters are off white formica, which will have to remain for the time being. – here's a link to some other pics of my condo: http://chameleon-interiors.blogspot.com/2008/12/christmas-chez-moi.html I have a lot of green and black wrought iron and painted furniture. One update, I am likely going to be adding recessed lighting, so either way I go, there will be much more light in the room! Stay tuned for a decision! Room Service – great kitchen, thanks for the link! BLACK! I am partial to living in a cave though! how do you feel about the two-tone look? Black for the bottom and a green for the top? can't wait to see whatever you do! The picture of "Jean-Louis Deniot – House Beautiful" has mixed black, white, cream, tan and brown together wonderfully. The two different colored cabinets are so popular right now. I recently repainted all of my white cabinets cream, except one bottom section of cabinets, which I painted black and I love it. If you paint the bottom cabinets black and the top cabinets the same tan color as on the Deniot kitchen wall, it would distinguish the cabinets enough from the walls and counter colors, plus give it some style. 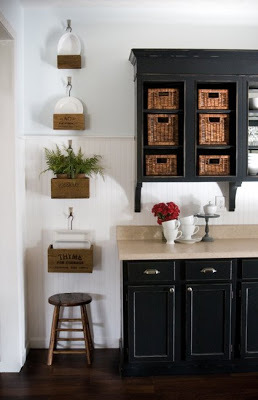 Your white knobs would continue to work as long as you keep the white counters. 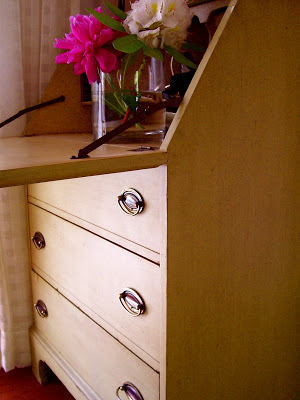 Eventually add granite, or faux granite formica counters in a tan and change hardware to silver. Additionally, you could add green as an accent color (like painting the baker's rack an antiqued green, and through towels, or a green pottery jar to hold utensils) then change the accent pieces out to red at Christmas (or whatever else you might like) as this color palette I have suggested is so neutral. All black cabinets with white counters and black and white floor is quite drab, IMO. Finally, I took two cabinet doors to a local cabinet maker, who was able to cut out the inset panels, then had a local glass shop cut two pieces of reed glass and glue them in place. It didn't cost more than $30 and added even more interest. Oh! And two other things I would do: Remove the piece of wood hiding the light fixture over the sink, change the light out to a small hanging light of some kind, and add a knob to the false drawer directly in front of the sink. I prefer the green look myself. I think that it brightens the area a bit and has a more homey look. The black look makes the area seem more like a restaurant or super modern kitchen. I think it depends on the look that you are going for. I really like the green. The black seems like it may make it really dark. Found you by google, trying to figure out what we are going to do with our kitchen cabinets, wavering between green and white. What hard decisions!